Inject energy into your everyday wardrobe with coloured jeans. We love the happy vibes of fuchsia slim fitting jeans on rainy days, keeping it cool in the summer with distressed white skinnies. This season, give your favourite indigo jeans a breather and invest in vibrant coloured jeans. Embrace the spirit of the festival season with acid hue skinny jeans, teaming them with oversized printed t-shirts and logo women's sweatshirts to keep it comfortable. When the sun is shining, go for a pair of pure white slim fitting jeans with a plain white cold shoulder tops to show off your tan, layering up with a blue denim jacket to add a structured twist. If you're looking for something more feminine, try pastel coloured jeans in coral pink or mint green, wearing with a delicate lace top and metallic metallic trainers to strike a unique balance of light and shade. Neutral coloured jeans start the weekend right when paired with a striped blouse and neat Converse shoes, best worn with oversized sunglasses and a slouchy tote bag when you're on the go. 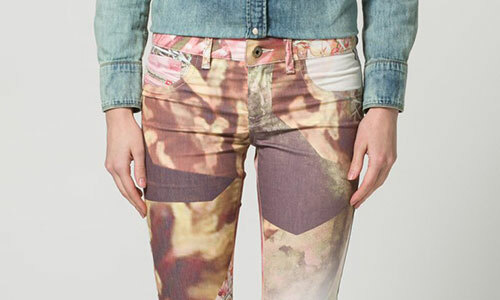 Creative and colourful, jeans with patterns or prints make a big style statement. They offer a good alternative to the more classic blue or dark jeans. 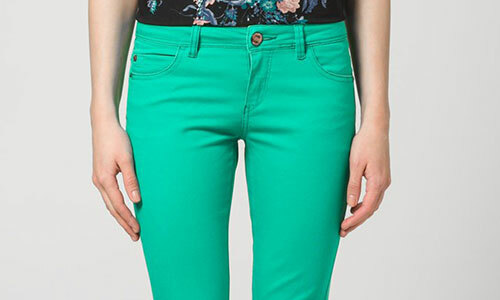 Coloured jeans are great for lifting your mood. Change up your usual black or grey skinnies and add a pop of colour to your look. Both genuine leather or ‘leather look’ jeans add a touch of opulence and sexiness to your look. Just like denim they will grow in character with age.